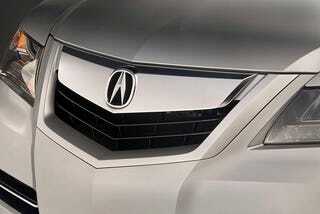 2009 Acura TL: More Details Revealed? One of the Honda forum fan-boys over at The Temple of VTEC claims to have seen a brand spankin' new 2009 Acura TL — most likely at the April dealer conference where we'd heard the big dealers got a chance to ogle the new four-door in the shiny flesh. While we're not expecting to see the bed sheet slide off the skin of the new mid-size from Honda's luxury brand until sometime closer to Septembet, the forumites are telling us to expect something similar to what we told you back in March, but the level of detail is — well — significantly more detailed. Hit the jump for the full scoop. "saw the car....3.5 w/280hp and 3.7 w 305hp....no mention of "S" Type at all.....the front and rear of the car in no way resembles the present car or TSX...larger than the present TL and present Accord....it is as drastic to the persent TL as the present TL was to the '03 TL.....20G hard drive on board for personal music recording ...push button start...."
"the only part of the tsx grill is the very top thickpart....slight resemblence...beyond that not similar looking at all....but the front and rear of the 09 TL is very futuristic, almost "transformer" in its look....the car was shown in new orleans april 11th to acura dealer body....end of sept release......rear lights on the '09 TL are a cross between civic 2 dr and camry....bold...tilted a bit down toward center...red lenses top and bottom ...clear back up in the middle but taper extensively around the side almost to the back of the c piller..the car looks sleek from the side yet agressive, angular from front and back...the car has no hatchback look at all.....from the side it is quite sleek looking ...sharp contrast from front and rear views which are very hight tech futuristic looking...the trunk lid has a bit of a dip in the center.....the rear lights and the rear bumper make the back panel of the trunk lid almost the shape of the grill.....5 sided.....topped off by a small lip spoiler on the tech model...the rear spoiler also has a crease in the center of the trunk dip.....the rear tail light form the side tapers greatly and almost reaches up the side to the rear of the c pillar....."